Marie Biscuits are our family’s favorite tea time biscuits. There are numerous desserts one can make using them and today’s recipe is a sweet treat that can be served in a get together or party. 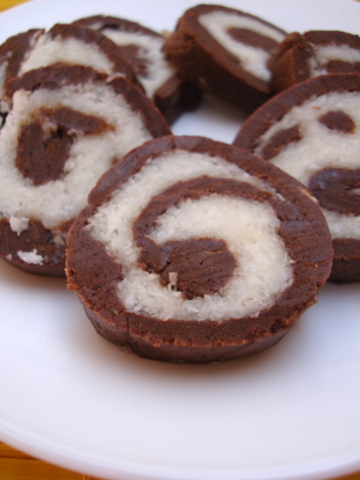 Eggless chocolate rolls, quick to make and delicious! Easy chocolate dessert that even a 12 year old can whip up in minutes. Make a powder of 12-14 marie biscuits, add a tbsp of powdered sugar, 1 1/2 tbsps cocoa pwd and mix well. Slowly add few tbsps of milk, little at a time, to form a pliable dough (like chapati dough). Keep aside. In another bowl, add 1/4 cup dessicated coconut pwd, 1/2 cup powdered sugar, few drops of vanilla essence or pinch of cardamom pwd and mix well. Add 1 1/2 tbsps of melted butter and mix well to form a sticky textured mixture. Roll the biscuit cocoa dough into an elongated shaped roti (thicker than a chapati). Spread the coconut-sugar mixture all over. Slowly roll the biscuit-cocoa roti to form a roll. Seal the ends and if the dough tends to break in between, lightly press to enclose and continue rolling. Wrap in an aluminum foil and set in fridge for 2 hrs. After its set, remove the foil and slice with a knife into 1/2″ thickness pieces and serve. this is awesome..takes me back to summer hols years ago when we were not allowed to use the stove on our own. We used to come up with these kind of things, always sweet, using biscuits, bournvita, milk, cream etc..
i just have one doubt. If we make them in rolls, and when we cut them, will they be in the above same shape? Yes, they will be the exact shape as above. Next time, will try to post step by step images of the recipe. Always dessert part is favourite to all. Especially eggless chocolate dessert is a wonderful treat for kids. Perfect Picture. very tempting and easy to prepare as well! I have seen many versions of the above recipe but yours is the picturesque one. will try soon. i always wonder what is the best substitute for marie biscuits. can you please guide? Well, there is no substitute for Marie Biscuits. They are the best. Having said that, you can try Nice biscuits, plain cookies, vanilla wafers or digestive biscuits. WOW…such a rich and elegant looking dessert…delicious! can u plz suggest me an alternative for dessicated coconut? There is no alternate to desiccated coconut. You can dry roast fresh grated coconut for 6-7 mts, cool and use. Or if you do not have fresh coconut, try almond or cashewnut powder. I too make these rolls.. looks perfect.. Such a easy and yummy recipe, thank you ! Sailu, what an amazing innovation. They look superb. Wow this looks amazing. Will try it out next time. I highly recommend this dessert for Nehal if he likes things made from marie biscuits. Thanks, Praveena. I have made that recipe a couple of times and they were finished in no time. Fantastic recipe. I have tested your recipes many a time and they are all yummy!! Sailu, can you guide me how to precook indian recipes and store them as I am going on a holiday and my husband only enjoys home food!! Please help me!!! can you post step by step pics of recipe because as i am new to cooking. it would be easy for me. Can we store these for a week? I have not tried storing them beyond 2 days in the fridge. You can freeze them. sailu garu, any substitue for aluminium foil????????? You can use a plastic wrap. I admire your work and your blogsite !!! can we use bournvita instead of coco pwdr?? I made these today. The taste was awesome but they didn’t hold the shape. I put them in refrigerator for 2.5 hours. Can you think of where I went wrong? The taste was awesome but it got al scattered in the dish. I figured out why they didn’t remain intact. When I sliced the roll after refrigerating for 5 hours, it came out as you have shown in the pic. Thanks for the wonderful and easy recipe. definitely a mouth watering recipe…jus hv a query….can we use cooconut powder available in markets,instead, of freshly grated coconut….waitng for ur answer. You have to use dry coconut powder for this recipe, not fresh. Hey sailu, These Are pretty good. I tried this and it turned up very well..thanks..
Looks yummy! Can I use granulated sugar instead of powdered? Hi Sailu, thanks for this recipe. It turned out really well and my family loved it.